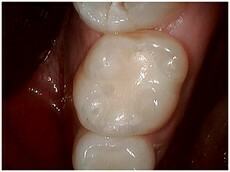 ALL-Porcelain crowns are the new aesthetic standard in dentistry today. 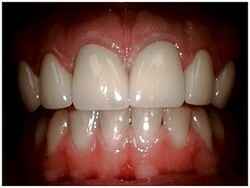 No more black lines around your gums. They truly can match the color of your existing teeth. The results speak for themselves! 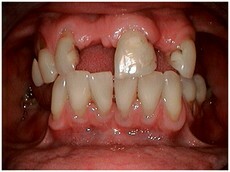 Patient had internal dark staining on upper right canine tooth. 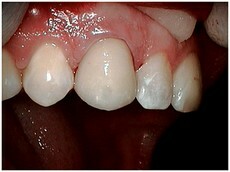 Porcelain veneer was placed to lighten color to match existing teeth. 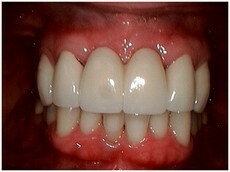 Porcelain veneers have many applications that can really change your smile. 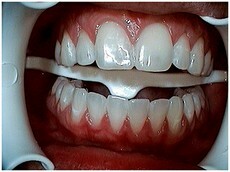 They can change the color and shape of your teeth. 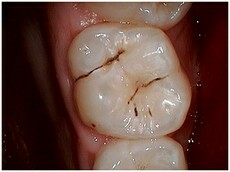 Porcelain crowns and bridges can change your smile. 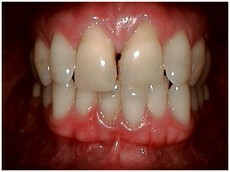 These before and after photos represent crowns and a bridge. 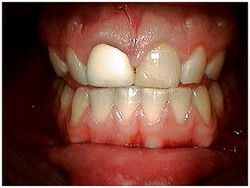 Can you tell which is the "false teeth"? Never be afraid to go without teeth again. 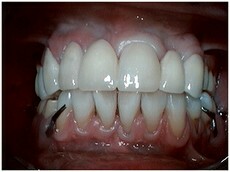 You will receive your new smile at the first visit. These temporaries are placed at the FIRST VISIT, ensuring that you can maintain all the daily activities you desire. They look great IMMEDIATELY! CALL TO SCHEDULE YOUR DENTAL MAKE-OVER TODAY! 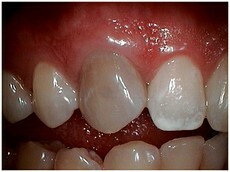 Removal of decay in pits and fissures and replacement with natural tooth colored fillings. ZOOM ADVANCED POWER ! 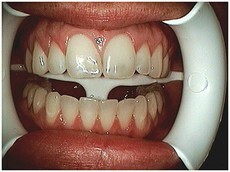 WHITER TEETH BY 8 SHADES IN 1 HOUR! Our Bleach Service provides the in-office service as well as trays for home use. This is 2 systems under one price!